Simply Waste Solutions, one of the UK’s fastest growing waste and recycling companies, has made its second acquisition of 2018 by completing a deal to buy the waste management division of London-based Dirty Harry’s Group. The deal will increase Simply Waste’s customer base by a further 500+ customers in the Central London area, making it now one of the largest independent waste management companies operating in the capital. As part of the acquisition, over thirty Dirty Harry’s staff, already operating in the Waste Division, will now become Simply Waste Solutions employees. Dirty Harry’s will continue to operate under its established brand name, focussing on its core businesses of Cleaning, Vending, Washroom Services, Janitorial Supplies and Support Staff. This is the second acquisition in 2018 for Simply Waste Solutions who, in January, purchased the wheeled-bin collection division of Oxfordshire-based M&M Waste Solutions. “We have always said that it is our intention to grow the business, both organically and through strategic acquisitions, and so this new addition will enable us to both increase our customer base and consolidate our already strong presence in the capital. Size is now becoming an ever important factor in the success of waste management companies, not only because of the continuous investment required in people and equipment but also due the increasing complexity in achieving compliance and meeting environmental standards”. “Through our growth strategy, and the resulting economies of scale, our commitment to our customers is to continue to deliver a highly, cost-efficient service whilst also maintaining the highest standards of customer service”, added James. According to Scott Knight, Managing Director of the Dirty Harry’s Group, “Although our waste management division achieved considerable commercial success over the last decade, it has become increasingly clear to us that this service is rapidly becoming highly-specialised and now requires a dedicated focus. A raft of forthcoming legislative changes looks certain to result in a period of consolidation within the waste industry. I believe this will result in just a handful of major operators who will come to dominate London’s commercial waste collection landscape for many years to come. We are therefore delighted to have agreed terms with Simply Waste Solutions, who is already a major force within London’s waste collection sector. 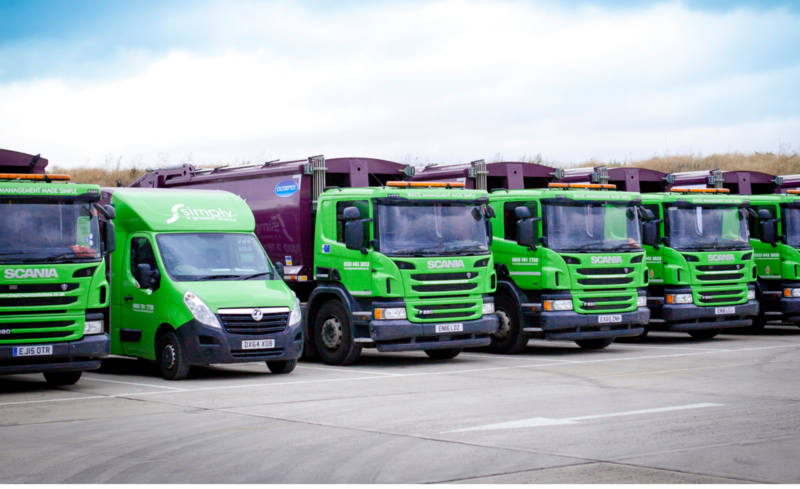 “In Simply Waste Solutions I believe we have found a company that will uphold our values as an independent service provider and who will continue to offer a viable alternative to local authority collectors,” added Scott. From very humble beginnings a decade ago, Simply Waste Solutions has grown from a 2 truck start up into a company that makes over one million customer collections a year, has an annual turnover over £30million, a fleet of over 50 vehicles and now more than 150 employees, with a Head Office located in High Wycombe, Bucks, and state-of-the-art logistics and waste transfer stations in Wycombe and Heathrow.